Pictured is Colin Steven Phillips, 40, of Hardwick Drive, at Arkwright Town, Chesterfield, who has been jailed for 18 weeks after he admitted two counts of theft. A thief who stole from his employer was caught when he turned up to work the next day and discovered he had been captured on CCTV footage. 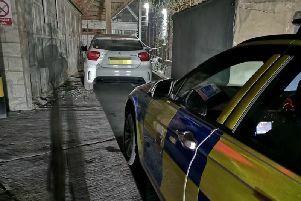 Colin Steven Phillips, 40, of Hardwick Drive, at Arkwright Town, Chesterfield, stole tools and cash from GH Motors, at Markham Vale, according to a Chesterfield magistrates’ court hearing. Prosecuting solicitor Neil Hollett told the hearing on October 2: “He attended GH Motors which was his place of work and he attended the MOT garage and searched for tools. “And CCTV showed him taking off a high-visibility jacket and concealing the tools and walking out and placing them in his car. Phillips initially denied the thefts and refused to leave GH Motors, according to Mr Hollett, until police arrived and CCTV showed him taking the tools and he was arrested. The defendant, who later confessed to police that he had stolen the tools, pleaded guilty to the theft of £600 of tools and £100 of cash belonging to GH Motors on September 17. He also admitted to the theft of £360 of tools belonging to another victim who was storing his tools at GH Motors. Phillips told police he had sold the goods on. The court heard that the thefts had been aggravated by the defendant’s previous record of offending. Magistrates sentenced Phillips at a later hearing on October 5 to 18 weeks of custody and ordered him to pay £1,060 in compensation.